However, with China’s more recent rise, what has emerged instead is the so-called “China model” featuring authoritarian capitalism. China is actively promoting this new model of China’s political and economic development in Africa through political party training programs, which constitute a key component of Chinese foreign policy toward Africa. China has seen remarkable economic growth in the past few decades. About 3/4 of the global reduction in extreme poverty since the end of the Cold War can be attributed to China. But as impressive as its experience has been, China’s growth model cannot be exported to Africa. Why not? China has a strong, stable central government and a huge population. Despite the inevitable levels of corruption resulting from an economy dominated by government investment and a civil society which is subservient to the government (lack of transparency, accountability / judicial independence / checks-and-balances, no freedom of press/assembly), the Communist Party is somewhat uniquely dedicated to investing in the human capital of its people and providing some semblance of a welfare system. These positive features that have fueled China’s growth are generally missing in African countries. African economies tend to be natural resource-based, which do not require investment in people for growth but rather patronage politics to keep ruling regimes in power. As a result, the African continent is dominated by poor governance, corruption, poverty and conflict. China also happens to be reaching the limits of its government-investment and export fueled economic growth model. Because of the Communist Party’s unwillingness to expand civil liberties, China’s greatest avenue for sustainable growth –it’s people’s innovative potential (really the only avenue for long-term sustainable growth for any country, but especially China due to it’s huge population)–remains underutilized. In short, while China’s model can (in the best case scenario) bring a country from low to middle income, it cannot bridge the gap between middle and high income (and as previously stated, the conditions needed for the Chinese model to bring Africa into middle income-dom simply do not exist). The Communist Party is facing resistance at home, due to the twin forces of increasing demands for political rights (an inevitable result of advances in communication technologies and globalization) and slowing economic growth. Instead of loosening its grip at home to promote economic growth, the Chinese government is tightening its grip abroad. It is effectively trying to buy more time at the expense of regular African people–this is neo-colonialism. But isn’t this the same as America’s goal of promoting democracy abroad? Perhaps ostensibly, but not functionally. Democracy is based on the concept of self-determination–of people determining their own future and having a government that carries out that vision. Decades of failures and hard-learned lessons in development reinforce the idea that effective democratic governance is the path to peace, stability, and sustainable growth. This is why the United Nation’s new Sustainable Development Goals (SDGs) are based on accountable, inclusive governance and the protection of human rights–i.e. effective democratic governance. The Chinese model of political economy, on the other hand, places little to no emphasis on the African people. It will enrich Africa’s autocratic leaders and Chinese businessmen in the short-run, leaving the host countries with rising inequality, continued extreme poverty, human rights violations, and conflict. The only thing the Chinese and American visions for governance and development have in common, aside from being based on capitalism, are that they are visions being offered by outside powers. Other than this, they could not be more different. China states that the training programs are strictly exchanges of opinions rather than an imposition of the China model on African countries. In other words, China invites African political party cadres to China to study the Chinese way of governance on issues they are interested in, but whether they eventually adopt the Chinese way is purely at their own discretion. The original article suggests that perhaps China is just offering best practices, take ’em or leave ’em, but other recent actions compound the idea this is part of a larger play. Considering increased military assertiveness by China (South China Sea) and Russia (Crimea, Syria), combined with the economic backing of new Sino-Russo-centric development institutions (the Asian Infrastructure Investment Bank (AIIB) and New Development Bank (NDB)), and China’s sharing of “best practices” (best for China, anyhow) look like the “soft power” component of a larger “hard power” play to actively and aggressively promote its interests. Contrast this with likely European (Brexit and other internal EU concerns) and potential American retrenchment (who knows what a Trump presidency could mean for our foreign policy), and an even more concerning picture emerges. 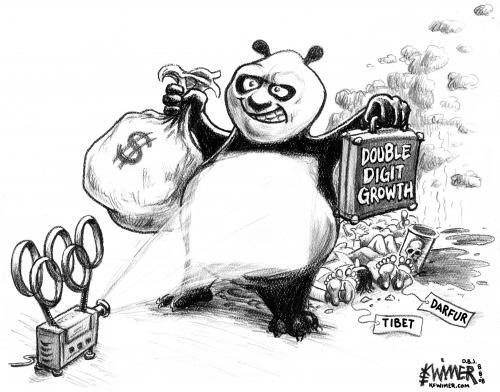 Western backed international organizations, though still the dominant players for now, will face increased competition from organizations (AIIB, NDB) that have lower standards for governance and human rights, potentially compromising what is already a lukewarm embrace of the human rights based approach to development (the IMF, still trying to shake the legacy of failed “Washington Consensus” policies, has embraced more pro-poor, context-sensitive, flexible, ex-ante conditionality; the World Bank, on the other hand, is dragging its feet on mainstreaming human rights into its operations). Global democratization–which has the benefit of near universal popularity among the civil societies of nations–is facing authoritarian headwinds. Overcoming these authoritarian forces requires strong, principled, long-sighted leadership. Lets hope said leadership is somewhere on the horizon. Categories: Blog Posts, Conflict Watch, Economic Outlook, Transparency Report | Tags: accountability, Africa, best practices, capacity building, China, civil society, democracy, hard power, Human Rights, soft power, Sustainable Development, washington consensus | Permalink. RIP Freddy Gray. Just 25 years old, a young man’s life was tragically cut short. We cannot let the ensuing chaos detract from this ultimate injustice. I have seen people on social media try to justify what happened to Mr. Gray by bringing up his criminal history. Not only is his rap-sheet immaterial to his death, but it is despicable that people would drag a dead man’s name through the mud to make their politically / racially charged points. This man is dead, he cannot defend himself. Furthermore, Mr. Gray’s criminal history of non-violent drug use / distribution is a common product of his environment. Not to make excuses for his past crimes, but his environment does offer some insight and context into his questionable choices. Another meritless claim is that Mr. Gray’s spinal surgery led to his death. Mr. Gray did not die on the operating table, and without some outside trauma to his spine he would still be alive today. Equally disgraceful to these meritless justifications of alleged officer misconduct are opportunists using Mr. Gray’s death to loot and riot. Mr. Gray’s family, for their part, has condemned the riots. Nothing fuels a counter-narrative like unlawful behavior; as the saying goes, with friends like these who needs enemies. A Department of Justice investigation is ongoing, and I fully expect that after a transparent investigation those responsible for Mr. Gray’s death will be held accountable. Yes America’s criminal justice system is flawed, particularly with respect to African American communities, but to assume that it is never capable of delivering justice belittles its many unsung successes. As of this posting, the 6 officers involved in Mr. Gray’s death have been charged with various crimes, including second degree murder and manslaughter, by Baltimore’s Chief Prosecutor. I can understand rioting after an unfair ruling, but not before a ruling even takes place. Some will argue that as a white man it is not my place to understand, and while I like to think I am generally pretty good considering things objectively, they may have a point. I do however know this; when comparing the track records of violent and non-violent protests in achieving meaningful reform in America, the more effective approach has unquestionably been non-violent. Those sympathetic to the rioters may argue that every successful non-violent protest was buoyed by a parallel violent movement. While it is impossible to completely decouple the effects of parallel violent and non-violent movements, I find this argument flawed. What positive role could violent protest possibly play in political decision-making when violent protests detract from public sympathy, and the state always has the overwhelming advantage in shows of force? To the contrary, in my opinion meaningful change results from strong leaders utilizing their rights to publicly frame issues in ways that even those who may, in their private thoughts, be ideologically opposed cannot as publicly elected officials reasonably challenge. Regardless of my understanding, the riots have, in the words of Baltimore’s African-American Police Comissioner Anthony Batts, embarrassed Baltimore as a city. Fortunately the negative actions of a few misguided Baltimoreans should have no impact on either the Baltimore Country or DoJ investigations. But ultimately it is not the short-term embarrassment or immediate economic consequences that should most worry those who wish to see Baltimore thrive. It is the long-term impact on investment that is most troubling, as the riots will likely exacerbate the very socioeconomic conditions which indirectly led to Mr. Gray’s death and the ensuing riots in the first place. The looting and burning of a CVS pharmacy and general store, which has been shown on just about every newscast in the past 24 hours, as well as the destruction of other shops, will tend to deter retailers from making new investments, economists warned. “One of the things that’s been growing in the area has been the tourism aspect and nothing puts off tourists more than riots and curfews,” said Daraius Irani, chief economist at the Regional Economic and Studies Institute of Towson University in Baltimore. “One of Baltimore’s credit strengths is it has a sizeable and diverse tax base,” said Moody’s analyst Jennifer Diercksen, noting the city’s universities, which provide thousands of very safe jobs – creating a stable base for Baltimore. Still, the city lags the rest of the nation on a per capita income basis. Its per capita income was $24,155 for 2012, representing only 86.1 percent of the national median, according to Moody’s. Its unemployment rate is higher than the U.S. average – according to the U.S. Bureau of Labor Statistics, Baltimore city’s unemployment rate in February was 8.4 percent versus the U.S. rate of 5.8 percent in that month. Still, economists said one of Baltimore’s problems is the sharp demographic split between the successful elite and an underprivileged population. “There is the vibrant, beautiful, urban community that is characterized by ongoing renaissance, and the poor, less educated, less visited, which faces more challenges,” said Basu. “Both Baltimores have been making progress in recent years. When private investment lags, jobs and tax revenue for social programs and public goods take a hit. Regardless of your political affiliation or personal beliefs, one or more of these things are needed to promote social mobility and social justice. Baltimore’s leaders must now prove their mettle by utilizing the city’s strong fiscal position to attract investors. The city’s leaders must leverage both public money and the public relations boost private companies would realize by helping “rebuilding Baltimore” towards securing public-private partnerships that benefit Baltimore’s poorest areas. The only silver-lining of these riots is that America is paying attention to Baltimore. While I think peaceful protests would have achieved this same outcome without the negative media coverage and economic backlash, the riots are now (hopefully) a matter of history. Moving forward, the attention Baltimore is currently receiving must be utilized as a positive. Another potential avenue for recovery runs through Federal government, which being within a stones-throw of Baltimore may be compelled to invest significantly in revitalizing the city. Of course these two sources of public funding–municipal and federal–should be carefully coordinated to ensure that maximum social benefits are realized. It is exactly trying times like these when strong leadership is most needed. Let us hope elected officials in Baltimore and Washington D.C. are up to the challenge. Community and religious leaders also have an role to play, both immediately in catalyzing anger into a sustainable political movement, and in the long run by promoting the roles of strong social values, resilience, and personal and social accountability in poverty reduction. I am confident that criminal justice will be served in the Freddy Gray case, and that this case will help spur more widespread criminal justice reform across America. Unfortunately, I fear the riots may have exacerbated the very problems that need to be addressed for more comprehensive progress on the social justice front. Categories: Blog Posts, Conflict Watch, Economic Outlook, Transparency Report | Tags: accountability, Baltimore, criminal justice, freddy gray, investment, justice, protest, riot, social justice | Permalink. Other experts and historians, however, say too much can be made of the moment. Walter Russell Mead, a professor of foreign affairs at Bard College, noted that the rise of China as an economic force was inevitable, and that its establishment of a rival lending institution was far different from the international behavior of the Soviet Union and communist Chinese during the Cold War. Then, he said, America’s rivals were trying to destroy and replace the economic order established by the United States and Britain after World War II. Now, emerging powers are emulating it, however imperfectly. Sure other countries have risen in prominence since America stood as the lone super-power after the Cold War, but has this really resulted in America’s decline? I would argue that building up strong allies to help promote America’s vision of international order–one based on democracy, human rights, economic and defensive interdependence, and more recently environmentally sustainable economic development–was exactly why the U.S. took the lead in setting up the United Nations and the Brenton Woods Institutions (the World Bank, IMF, and GATT). The IMF was originally conceived to promote currency stability and help countries overcome short-term balance of payments issues. But as technological advances made the world smaller, the IMF took on a much larger mandate, and began extending loans to help developing countries modernize. The so called “Washington Consensus” linked development loans to “ex-post” (after the fact) conditions such as hitting fiscal targets (reducing the size of government) and liberalizing trade. While these policies by and large do promote growth in already developed countries, they ignored the historic lessons of the world’s developed countries. Every advanced country relied on some degree of protectionism to cultivate its own industries and government spending to build both physical infrastructure and a skilled workforce as it modernized. The “Washington Consensus” programs did not allow for policy space based on the historical experiences and current realities in the countries they intended to help. As I have often written, economics–particularly development economics–is highly context-sensitive; the “Washington Consensus” was simply to rigid and narrow-sighted to work. The “Washington Consensus” was a consensus failure, and left many countries worse off than before they accepted this “help” (see “the lost decade” in Latin America). Thankfully the IMF abandoned this flawed set of policies. The failure of the Washington Consensus led to IMF to reconsider how it does business–the “conditionality” attached to its loans. Instead of relying on a rigid set of targets a country must meet in order to continue to receive support, the IMF now focuses on pre-set “ex ante” conditionality. If a country has a sound macroeconomic position, it can tap into IMF financing while maintaining the policy space needed to address the needs of its citizens (and ultimately maintain its legitimacy). The IMF will have to deal with the specter of the Washington Consensus for some time, but going forward it has evolved in meaningful ways. The General Agreement on Tariffs and Trade (GATT) officially became the World Trade Organization (WTO) in 1995. The WTO sets rules for global trade and provides a forum for airing grievances. With membership covering 96.4% of global trade and 96.7% of global GDP, the WTO is unquestionably an important institution. Critics often argue the WTO is ineffective, but any organization whose stated goal is the resolve international trade disputes is by definition going to be contentious. I would argue that the WTO has helped keep trade disputes trade disputes, and that without it many of these disputes could have ended in armed conflict. In recent years, international trade news has been dominated by two proposed regional agreements, the trans-pacific partnership (TPP) between the U.S. and Asian economies, and the trans-atlantic trade and investment partnership (TTIP) between the U.S. and Europe. There is no consensus as to whether regional free trade agreements (FTA) such as these undermine the global free trade movement, or if they are building blocks towards this goal. But one thing is for certain–free trade agreements create winners and losers. The winners tend to be the wealthy who are positioned to benefit from greater market access; the losers tend to be wage earners. In the context of political dysfunction and simmering class-warfare in America and beyond, it is necessary that policies to transfer some of the gains from the “winners” to protect the “losers” of any FTA are baked into the agreements themselves. The ability of governments to address the inequality and environmental impacts of any FTA will greatly affect its historical legacy. The United Nations is arguably the most important of the international institutions. In addition to providing a forum for countries to address one another, the UN also serves a global policy adviser, giving it the strongest normative mandate of any of these organizations. The Millennium Development Goals (MDGs) are 8 specific goals whose intent is to guide the trajectory of the developing world. The successes of these goals has been uneven–some countries have a great record, while others not so much. 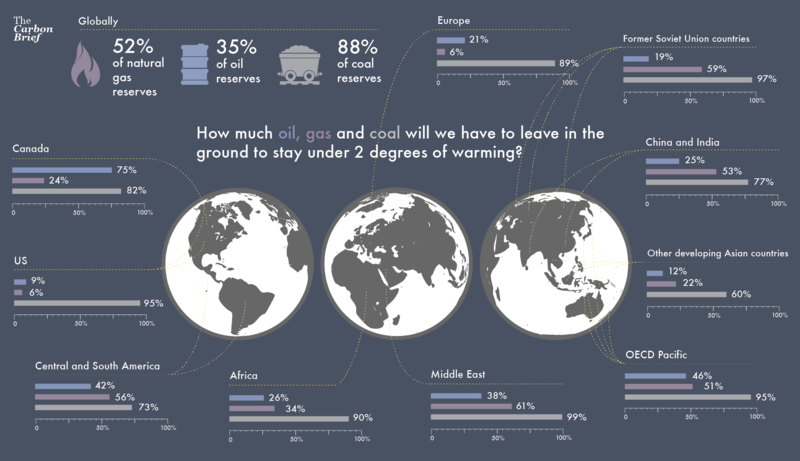 As these goals are set to expire at the end of 2015, they are commonly viewed as beneficial but imperfect. Their successors, the Post-2015 Sustainable Development Goals (SDGs), aim to build on their successes while learning from their short-comings. There are a number of ways the SDGs deviate from the MDGs. For one, they are much more inclusive and consultative. Seen as being drafted behind closed doors by the global elite, the MDGs were hampered from the start. Conversely, the SDGs are being drafted with input from numerous thematic and national consultations with the very people they are intended to benefit. There is also greater emphasis on the roles of various stakeholders (governments, private sector, NGOs, civil society, and international organizations) with regards to both financing the agenda and being accountable for their operations in the developing world. “Who Will Be Accountable?” highlights these common but differentiated responsibilities, providing general guidelines for holding those who violate the SDGs accountable. Between the launch of the Post-2015 Development Agenda (the SDGs) and the 2015 UN Climate Conference in Paris (which is expected to result in the first universal global climate treaty), 2015 will prove to be a pivotal year for sustainable human development initiatives. One area the U.N. has not reformed sufficiently is in promoting global security. Given that security is a necessary precondition for sustainable human development, the significance of this shortcoming cannot be understated. Nowhere has this problem been more acute than in the Middle East, where armed conflict has left 1 in 4 children out of school, led to immeasurable economic, physical, and psychological damage, and has completely overwhelmed the international humanitarian assistance network. The inability to protect children is especially alarming, as it plants the seeds for future conflicts. The United Nations needs to respond more decisively against regimes that commit gross human rights violations. The concept of national sovereignty is meant to protect a country from outside invasion, not act as a shield for human rights abusers. The Responsibility to Protect (R2P) was supposed to put peoples rights before national sovereignty, but it has proven to lack the teeth needed to provide meaningful protection. The need is clear, as I have called for in the past, for the UN General Assembly to have a mechanism for overruling UN Security Council vetoes. Such a reform would give the R2P the power it needs to fulfill its important mandate to prevent / end gross human rights violations. The World Bank regularly fails to enforce its own rules protecting people in the path of the projects it bankrolls, with devastating consequences for some of the poorest and most vulnerable people on the planet, a new investigation by the International Consortium of Investigative Journalists, The Huffington Post and more than 20 other media partners have found. Days after ICIJ informed the World Bank that the team’s investigation had found “systemic gaps” in the bank’s enforcement of its “social safeguard” rules, World Bank Group President Jim Yong Kim acknowledged “major problems” with the bank’s resettlement policies and vowed to seek reforms. Being a “net benefit” for the developing world is not a high enough standard for the World Bank, it must adopt a “do no harm” principle in all its projects. To achieve this goal, the World Bank should emulate the UN in consulting with those who will be affected by their projects. The World Bank has an important role to play in promoting the SDGs, but first it must get its own house in order. Some may point to the recent rise of parallel international organizations such as the Asian Infrastructure Investment Bank (AIIB) and the New Development Bank (NDB) as further signs of the deterioration of an American led international order. Indeed, there are serious governance questions these institutions must address, lest they be counter-productive in the pursuits of promoting peace and eradicating extreme poverty. It would be most constructive to have the UN promote these values (accountability, good governance, etc.) to emerging international institutions, not the US. The UN has international legitimacy; the same message coming from the UN would likely be much more well received. US-centric international organizations are free to work with these parallel institutions or not, and their positions can evolve as these new institutions reveal their values through their actions. But as professor Walter Mead aptly points out, these institutions are not challenging America’s Post WWII vision of international order, they are doubling-down on it. As the saying goes, imitation is the greatest form of flattery. Categories: Blog Posts, Conflict Watch, Economic Outlook, Green News, Transparency Report | Tags: accountability, AIIB, brent woods, corruption, democracy, Human Rights, IMF, mdg, R2P, sdg, Sustainable Development, TPP, TTIP, UN, washington consensus, WB, WWII | Permalink. This week Georges, one of five Haitian and Haitian-American plaintiffs named in the case, may be one step closer to being granted his day in court. Institute for Justice and Democracy in Haiti (IJDH) lawyers will get their chance on Thursday to argue that the lawsuit should go forward. It was filed in a federal court in New York a year ago, and the United Nations has declined to acknowledge it, on the grounds that the organization enjoys diplomatic immunity. The IJDH’s lawyers are demanding three things: funds to fight the ongoing epidemic and clean up Haiti’s rivers (only 1% of a $2.27 billion 10-year pledge have been raised), financial compensation for victims and an apology from the United Nations. Implicit in their lawsuit, however, is the far bigger challenge, lawyers say, to the U.N.’s immunity from prosecution. The Haitain Cholera epidemic and lackluster response remains a black cloud over the UN, as it should. The Post-2015 Development Agenda, which starting at the end of 2015 will influence the direction of national development plans and hundreds of billions in development aid, has human rights based accountability at it’s core. The Agenda calls for all actors–public, private, non-profit, etc.–to be held accountable for the human rights implications of their actions. The UN should have owned up to it’s mistakes in the first place (“waived it’s immunity”), taking the opportunity to lead from the front and show that all actors, even the UN itself, must be held accountable in order to promote sustainable human development. Unfortunately it did not, necessitating a negative PR campaign and legal battle. Furthermore, if the lawsuit makes it to court it could set a costly legal precedent, hampering the UN’s ability to respond to crises going forward. The UN has gone to great lengths to ensure the Post-2015 Development Agenda is inclusive, participatory, and well received by people around the world. These decisions were made in response to a perceived weakness of the preceding Millennium Development Goals; having been drafted by development professionals behind closed doors, they did not fully address many impediments to poverty eradication (specifically those related to political rights and good governance–empowering vulnerable people to become active participants in development, as opposed to passive recipients of aid). 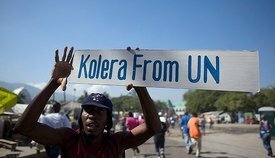 Refusing to sit down with Haitian Cholera victims is not only a failure of justice in Haiti, it threatens to undermine support for (and therefore the efficacy of) the Post-2015 Development Agenda. The UN is often accused of being ineffective and useless. As someone who is well versed in economic development, I know that these claims are generally made out of ignorance; there are checks in place which purposefully limit the ability of the UN to impose it’s values on a sovereign nation. This case, however, is different–the only thing holding the UN back from championing it’s own principles is the UN itself. It is not too late for the UN to reverse course and make this right, but an about-face on this issue does not seem to be forthcoming. As a supporter of this organization and it’s many important missions, I hope that its leadership recognizes the damage caused by its current course of action. Categories: Blog Posts, Transparency Report | Tags: accountability, Cholera, Haiti, Human Rights, Post 2015 development agenda, UN | Permalink.